Existing at the fringes of Washington D.C., the Club consists of four eccentric members. Led by a mysterious man know as "Oliver Stone," they study conspiracy theories, current events, and the machinations of government to discover the "truth" behind the country's actions. Their efforts bear little fruit --- until the group witnesses a shocking murder ... and become embroiled in an astounding, far reaching conspiracy. Now the Club must join forces with a Secret Service agent to confront one of the most chilling spectacles ever to take place on American soil --- an event that may trigger the ultimate war between two different worlds. And all that stands in the way of this apocalypse is five unexpected heroes. After ready The Collector by David Baldacci recently, I was most excited to get hold of another title that features the same group of most interesting 'misfits'. This, in fact, is the first book of the series and it was good as it introduces and brought depth to some of the characters that wasn't really in the focus in The Collector which was book number 2. The Camel Club is very different from The Collector. The thrill here is more espionage in nature. There's an investigation on a murder but that was just a small part in the overall storyline. 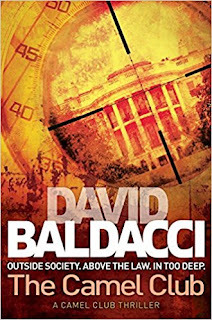 Overall, I still like The Collector better but The Camel Club is a close favourite and I am looking into exploring other titles by David Baldacci which features these characters. Can't wait to look for the other titles.